Isn’t it amazing how love can make the world go round? It is such a powerful feeling that it can remove the prefix “im” in the word impossible and turn it out with the resounding ‘possible’. During our most recent trip to Indonesia I asked my boyfriend, Steven, on what made him endure the long flights for days. I couldn’t imagine how strong he was to fly from Incheon to Ninoy Aquino International Airport (NAIA) for four (4) hours. From NAIA, to fly for another hour to reach our place so he could say hello to my family and guarantee to my mom that we were going to be okay. Then, from our house to travel to NAIA. Lastly, from NAIA to Jakarta, Indonesia. The flight did not stop at that. We had another flight from Jakarta to Yogyakarta on the same day. Imagine how exhausting it could have been. It was truly mind blowing. I would have been physically drained if I were the one who did that. So, I asked him where and how could he stand such hardship and with so much of sleep deprivation. I thought he would answer me in the usual way that he was a man and that he was strong but he answered that he did it because of me. I felt like my hair grew in great lengths that it could almost be compared to Rapunzel’s hair. It was an answer that made my blood rush through my veins and got stuck in my cheeks. Blush upon blush. Just like what I feel whenever my other half is with me was what I guess Maria and Leon also feel when they are together too. The story mostly revolved around Maria, Leon, Baldo and their trip to Nagrebcan in the short story entitled “How My Brother Leon Brought Home A Wife,” by Manuel E. Arguilla, a Filipino writer. The setting was in Nagrebcan, Bauang, La Union where the author of this story was born and the point of view was in the first person with Baldo, the younger brother of Leon as the narrator. The creativity of Manuel E. Arguilla was evidently shown on how he described the picturesque scenes going to Nagrebcan. The sun, the sky, the sea, the hills — the scenery. Those were vividly described that I can almost feel as if I was also travelling along with Maria, Leon, Baldo and Labang. Throughout their trip, Manuel Arguilla did not fail to touch my heart with the love between Maria and Leon and I guess all those people who are deeply in love with their partner can relate too. The short story started with the detailed observation of Baldo toward Maria from her physical features up to the manner she interacts with the people around her and toward her surroundings. Baldo was filled with curiosity regarding his sister-in-law who was born and raised in the city. Moreover, Baldo and Leon’s father was even in doubt if Maria could really adjust to the life in the province. Leon’s father might somehow prefer a woman from the same province to marry his son but it turned out that Leon married a woman he met in the city. The father has some doubts about Maria so he instructed his son, Baldo to pick up the couple with Labang and the cart instead of with a calesa, In addition to that, Baldo drove through the fields up to the rocky bottom of the Waig instead of driving to the Camino Real. Even from the start, it is undeniable that Maria is a simple and a humble nature woman. When Baldo told her that she could touch Labang, she hesitated for the fear of its horns. However, Labang was very dear to her husband. That moment, despite her fears, Maria approached and touched Labang’s forehead and eventually loved caressing it. As I read the story, it was kind of a cute thing the way Maria twisted the name of Leon and call him as Noel instead. Perhaps, the name Noel is more city-like than Leon. All throughout the trip Baldo witnessed the sweetness of Leon and Maria to one another. He did not say anything against Maria based from his sister-in-law’s actions and words. Even after they reached their house, he still admires Maria and was hoping to be as lucky as his older brother when it comes to having his own wife. Maria was going to meet Leon’s family. She was anxious. To ease the worry feeling of Maria, Leon sang “Sky Sown with Stars.” It was the song that Leon and his father used to sing when they worked in the field at night. Maria accompanied Leon in singing the song which for Baldo was something surprising to hear. Before they reached the house, Maria confessed the fear she had in her heart. What if Leon’s father wouldn’t like her? What if Leon’s family told him that they did not like her? How will she adjust to her in laws or what would she do to get the approval of her husband’s family? From a girl’s point of view, this is something that worries us. Actually, even when it comes to meeting our partner’s friends, worrying seems to accompany us all the times. In love, there will always be setbacks and roadblocks to test how far your love can go. It is not always a bed of roses and once someone overcome the obstacles and hardships it means that their love is genuine. Maria does not know what is in store for her when she meets Leon’s family but because of love, she does not quit. Amazingly, the seriousness of a person in love is measured on how he or she can brave the storm or hurdles in a relationship. She does everything with all her heart, without pretensions, without hesitations. In the story, Maria was fascinated on the beauty of Nagrebcan, the simplicity of life. In fact, she was glad that the houses, the buildings, and the noise in the Ermita, Manila where she grew up were not present in Nagrebcan. She embraced not only her love for Leon but also everyone and everything that Leon loves even she was raised in modernity of the city. She did not think highly of herself and treated everyone with respect. That story is seriously have an interesting concept. Thanks for the short review. I badly want to read it now. But, what about the son-in-law and mother-in-law relationship? Really liked your review, and the book seems like a nice read as week. As I was reading about Maria worrying that his father wouldn’t like her, and later you added that girls worrying about more than just parent not liking us. This is so true, and it doesn’t matter what culture you belong to. My personal thinking process goes to find the causes of that. And I think it’s because all of us, absolutely all of us, are told to be a good girl many many many times. And it causes good behavior, but also causes girls to struggle with self image and need for approval from others. What a review! It certainly makes me want to check out the book. I know my friend would love the storyline. I can’t remember when was the last time a read a novel written by a Filipino author. While reading your review, I can already imagine the characters, the trip to La Union, and I could feel what Maria was feeling. The title alone piqued my interest. My husband had told me about an ex girlfriend he had had. The only one he had before me. He would drive 4 hours to and from even if they would only spend one night together hanging out. Then, when he met me, he would drive to where I live and spend time with not just me, but also my 3 kids. Love is a strong thing. Makes us do things we might not otherwise have the strength to do. Awwww it sounds so sweet! :’) I’ll have to check it out! “Because of love, she does not quit!” That is so sweet and awesome. I don’t know if I could do the same all for love. Interesting title! It really isn’t a book that I would normally consider picking up, but at the very least, it sounds like the premise is unique. This sounds like a very sweet story. I might need to check it out. Interesting concept. Would love to read more! What a wonderful review! Well written and honest. Love that George Sand quote. I’ve never heard of this book. Love is such a universal theme. It can cause such joy as well as such angst. This sounds like an entertaining read. I love how you introduced your review with the story about your husband’s travels. Love is a powerful force, and when we find the one we are meant to be with it is indeed a magical experience. Thanks for this short review. I used to read a lot of history books when I was younger. Now as I advance in age, I guess books on relationships beckon me. I havent read the story yet but your review made me want to grab my copy. I like how you were able to narrate the love between Leon and Maria. Enjoyed as well how you described the younger brother’s admiration to his sister-in- law. 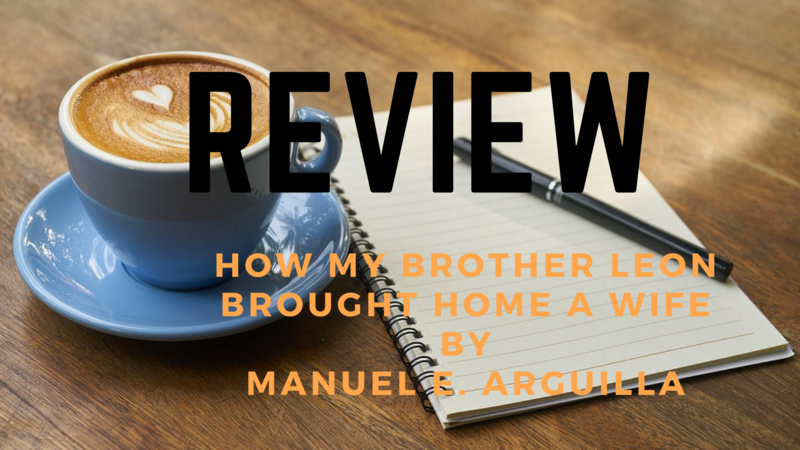 But more than anything, it is perhaps the beautiful story of Manuel Arguilla that made the story worth reading.